Now that the holiday season and cold weather is upon us, our project group has decided to turn its efforts towards the less fortunate. 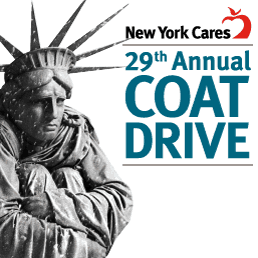 They have decided to take part in the 29th Annual New York Cares Coat Drive. NYMA is now an official drop-off location and the cadets are asking for help in donating new or slightly worn coats. We ask that all donations be received by November 26th (which is when the students return from Thanksgiving break). It is a perfect opportunity to clean out your closets and help people in need at the same time. For more information, please visit newyorkcares.org/coats. To arrange a drop-off please contact Yvette Furnia at yfurnia@nyma.org or 845-534-3710 x4800. Thank you!